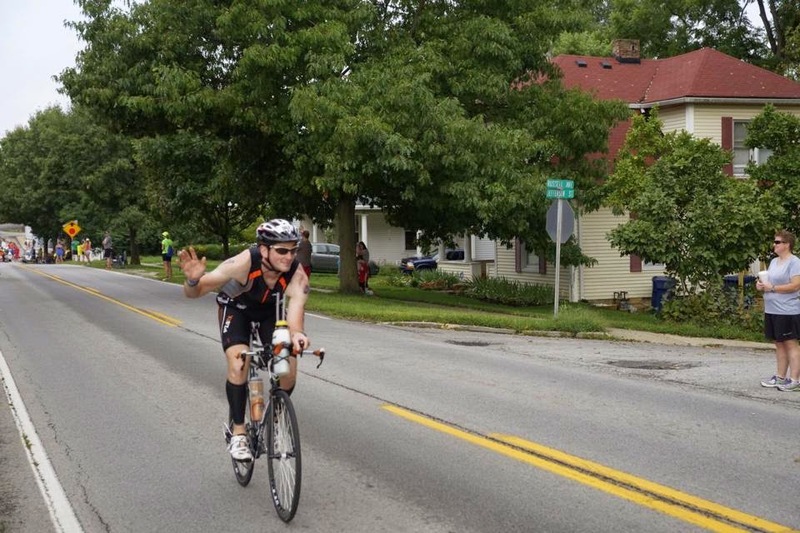 After I started to run out of transition, I went under the "bike out" arch and started the bike leg on my watch. I realized, as I was doing it, that I wasn't running over any timing mats/lines so I started my watch a bit early on the bike. It didn't end up being a problem, luckily! I got to the mount line, and struggled to get clipped in for a few seconds and then I was on my way! 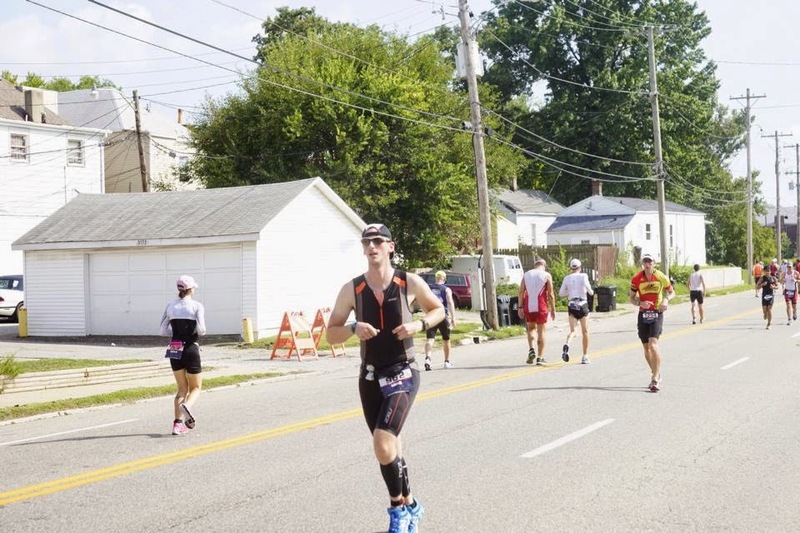 I knew that Mike was going to pass by me, since I had gotten out of transition ahead of him, and within the first mile he passed me and said, "I guess you were faster out of transition, huh?!" (This fact caused my family to miss me leaving transition because I was so speedy and they expected me after Mike, ha). Mike and I knew that the first 10-15 miles of the course (and as a result, the last 10-15 miles) were flat. Since the rest of the course had some hills, some major and the rest rolling, I made sure to not go out too fast. I also focused on not drafting, because the officials were out in full force! The bike on River Road had no issues, the temperature was still around 75-80 at that point, but we had cloud cover. 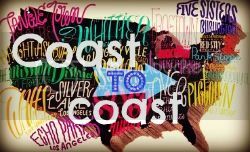 Our friend, Beth, had told us before the race to break it up into small chunks. So I just focused on every 2.5 miles, when I definitely took in water/sports drink/nutrition. I was also drinking in between those miles as well. The first major hill came around 15 miles. I kept playing tag with this one guy, he had one of those muscle/bones jerseys on, and I said to him, "I guess we're going to play tag". He laughed and said he guessed so. I felt good going up the hills but I knew I had to take it easy and tried not to tax my legs. 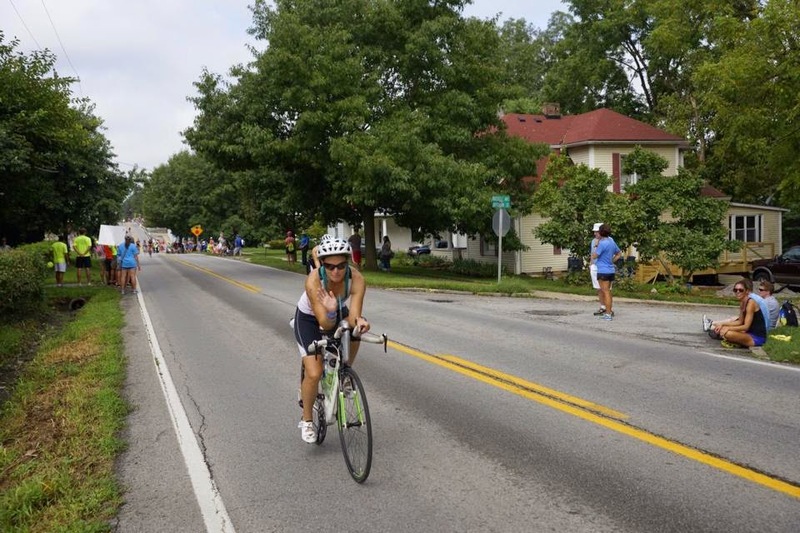 The Louisville bike course is an out and back, with another out and back that you do only once, and then two loops before you head back to transition. I was banking on seeing Mike on the one time out and back, which had the worst downhills and uphills, and as I was heading "out", I saw him heading "back". I yelled to him and we waved at each other! I definitely took it easy on the downhills, I didn't want to crash especially with two way traffic, and at the top of one hill there was a spectator dressed as "death" and another dressed as a devil. I am timid about making left-hand turnarounds so as I approached the turn, I unclipped my right foot and took it slowly. I guess I was going too slowly (but I made it without falling!) because I guy behind me was yelling, "turn! turn!". I didn't let that rattle me and continued on my way. I saw Gabi as she was making her way "out" and I was making my way "back". I think she heard me but it registered after we were already by each other. As I was going up one of the last major hills in this section (around 25 miles), I put my bike into the little ring and then boom! I couldn't move. I had dropped a chain (and it was a bit stuck). I unclipped and pulled over. Panic took over for a second (ok more than a few seconds) and I tried to fix it. I got chain grease all over me, and I couldn't figure out how to get it back in place. Luckily, or not so luckily for him, another guy dropped a chain in the same place I did! I didn't want to stop anyone who didn't have to stop (though they kept asking if we were alright, as they kept going). But as he got going again, I said, "could you help me?" He was so nice and he stopped and fixed my chain! Right when he fixed mine another woman came down and said, "I dropped a chain too and I don't know what to do or how I didn't it!" I asked if she had put it in the little ring, which she said yes, and I said that was it. I took my bike, and the guy started to work on her bike. As I took off I said to him, "I will mention you in my blog!" I don't know his name or bib number but THANK YOU! You saved my race! After that I just wanted out of the out and back section. I also didn't put my bike into the little ring until well into the first loop of the bike course (dumb or not, I didn't want to drop a chain again). As I made the turn toward La Grange, I saw the guy I was playing tag with (as well as another woman I played tag with a lot). I said, "I haven't seen you in awhile!" After that, I didn't see him again. 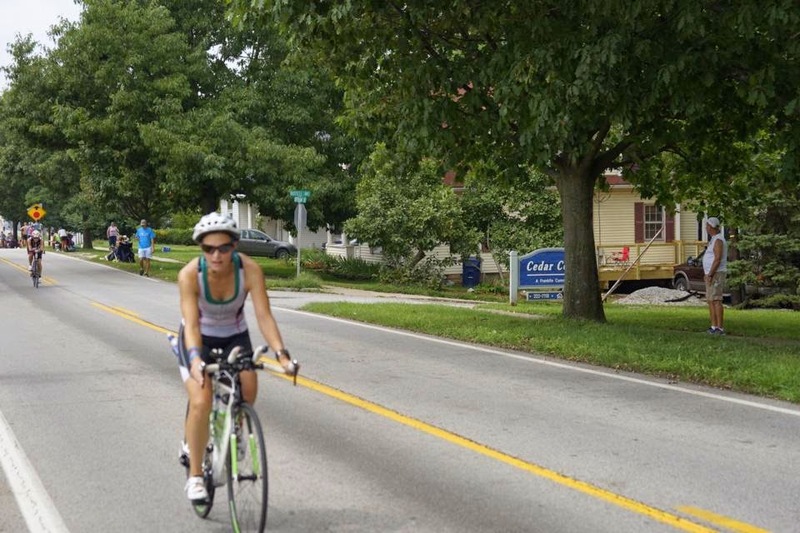 I knew our supporters would be in La Grange at around 40 miles, so I just focused on getting to them. I had tossed one of my water bottles at an aid station at this point and I still felt really good. When I got through one of the cheering sections near La Grange, I approached the rest of the cheering section. On the sidelines, my brother, Justin, and Hanna were sitting waiting for me. 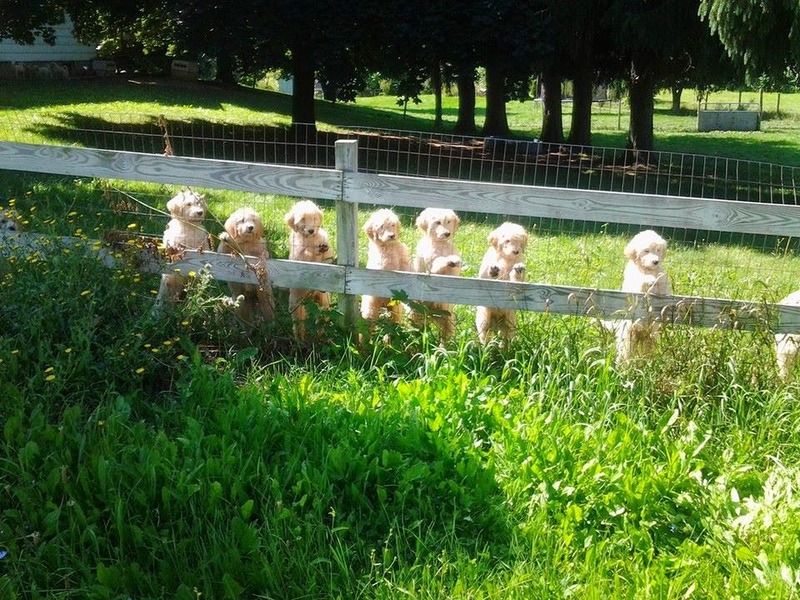 Luckily they saw me because I might not have noticed them! They cheered loudly for me and I continued on my way. I went through where the announcer was saying some people's names (he didn't say mine, but he did say Mike's when he went through). I was scanning looking for the rest of our people and then I saw my mom and dad! I told them I had dropped a chain but that I was good, and continued on my way. I never saw Mike's parents and Rob during the first loop, so in true Jamie fashion I started to panic about Mike. I tried to not think about it and just focused on getting around the loop and back to our people. The rolling hills weren't bad at all! We put in such good training that it wasn't even hard. I passed so many people on the uphills (yet they caught me on the downhills most of the time). One guy told me, "you are crushing this course!" I laughed when he said that. When I turned down Ballard School Road the first time, I took it easier here because it was so narrow with some downhills and uphills. There was a bump that was marked and then a second bump and I heard "skiiiiiid" and my aero bottle had fallen off my bike! For one second I thought about stopping, but I just kept going. From then on I had to take two water bottles at the aid stations (one for drinking and one for pouring on myself to keep cool). I only peed on the bike, yes ON the bike, 1.75 times. I wasn't concerned since I had peed twice during the swim. As I approached the second loop, a guy next to me said, "isn't that the sweetest sight?!" I agreed but thought, going toward transition would be even sweeter! I had picked up the pace, especially because of stopping for 2-3 minutes due to the dropped chain, and I pushed the downhills and even the uphills a bit. Thumbs up for 70 miles done! When I got to the special needs section, I skipped taking my bag and said goodbye to my CO2 cartridge and spare tube. I knew my brother and Hanna would be coming up soon (around mile 70) and when they saw me Hanna yelled, "easy peazy lemon squeezy!" That made me laugh. When I got to my parents, Mike's parents were there this time! I said, "is Mike alright?!" and they told me he was and I said, "I didn't see you guys the first time!" Rob was up the road a bit and I also told him that he had made me nervous because I didn't see him the first loop. During training miles 70-90 were always tough for me mentally, I was bracing for that during the race but it never happened! I just kept getting faster on the bike! 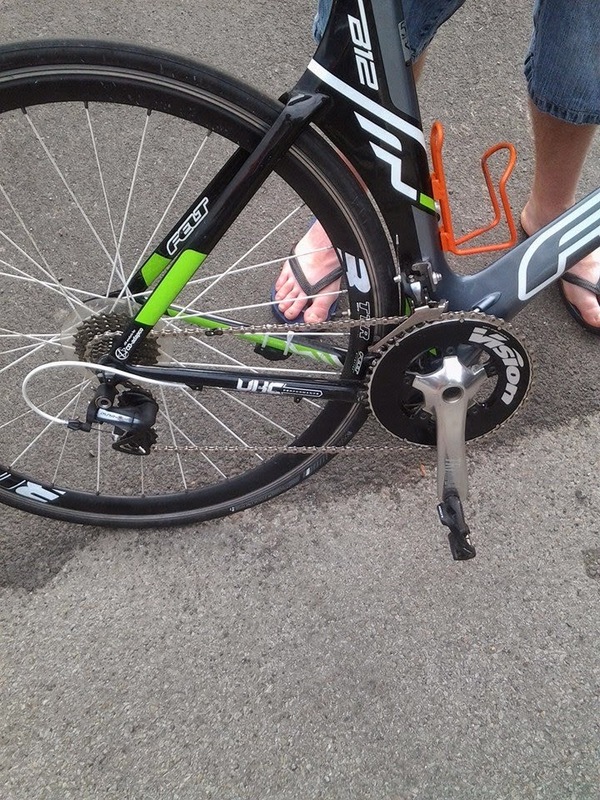 I went down the road again where I lost my aero bottle, and I saw it on the ground, and someone had crashed. An official was helping her out on the sidelines. As I approached the loop turn, this time I got to keep going! I had been playing tag with a new guy but not for as long as the other people. When I went by the out and back, that we didn't have to go down this time, I told a woman passing me, "I'm glad we don't have to go down there again!" There had been a few spectators in other spots on the course and I liked two signs in particular that I saw: "Crotch on fire" and "Smile if you aren't wearing underwear". I smiled. 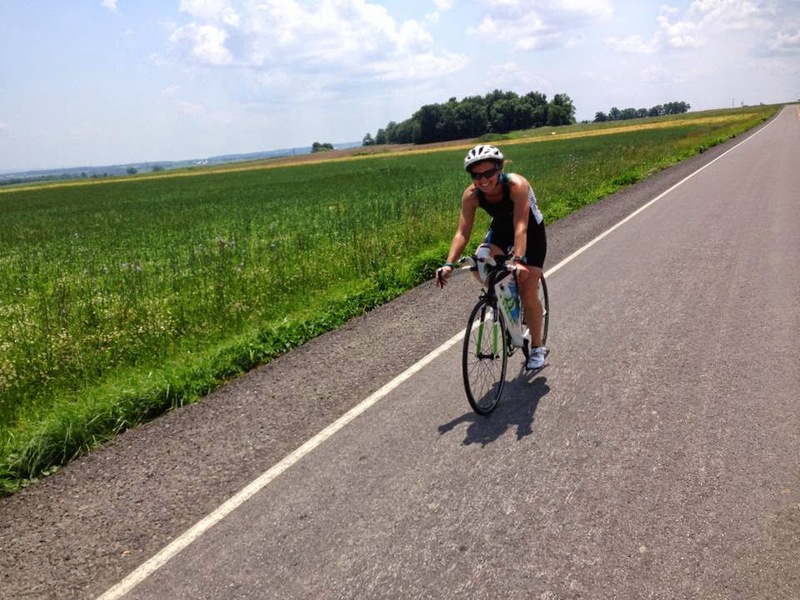 As I approached 100 miles, a guy went by me and said something about how it was almost over. 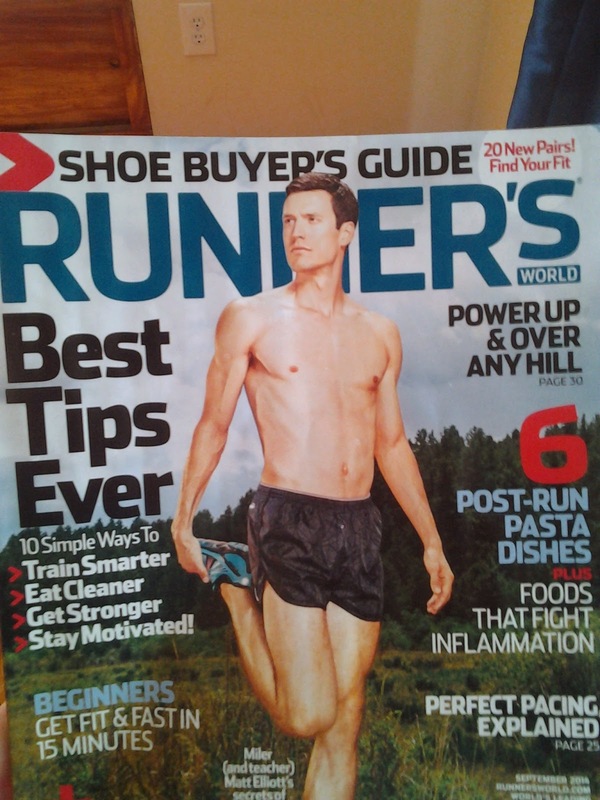 I said, "I'm ready to run a marathon". He said, "I'm ready to be off the bike!" (Side note: Mike helped a guy at mile 96 with some CO2, he gave him two cartridges, so our race day karma evened out). The last 15 miles were downhill/flat and I tried to spin easy to get my legs ready to run. I took a gel with 10 miles to go so I wasn't taking in any solid food right before running. As I made the final turn, I heard volunteers saying the dismount line was just up ahead. I dismounted, and walked my bike toward the volunteers who were ready to take it. 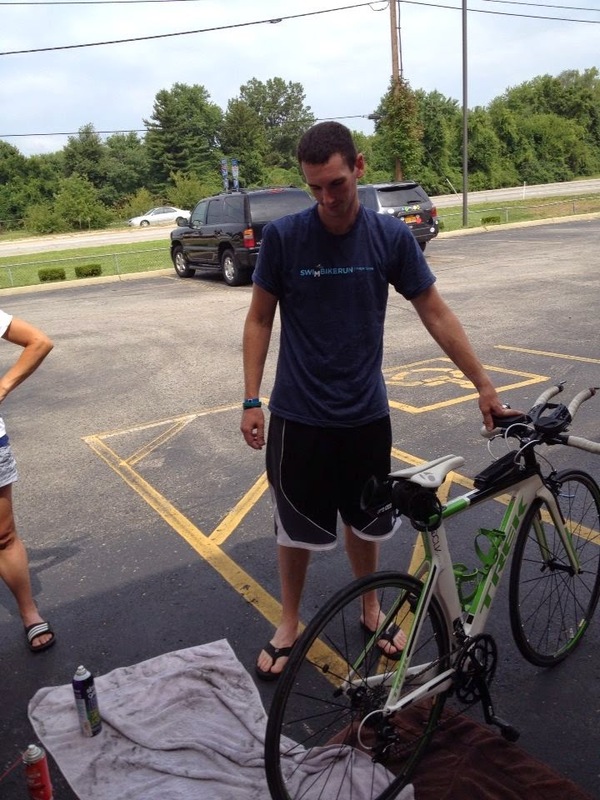 After handing off my bike, I took my bike shoes off and ran into transition to get my bag. This time a volunteer did help me, and I asked her to open an antibacterial wipe (so I could get the grease off of my hands) and started to put my stuff on. I put one shoe on and had to put my calf sleeve on over it! Then I got my other sleeve on, shoe on, and bib. I had my chews and I was ready to go. I ran out, got more sunscreen on and started the jog toward the run out. Only a marathon left to go! After all of our pre-race activities, race morning's wake up came early at 4:30am. I had actually slept relatively well, better than I did on Friday night, and we got up quickly so that we could be ready to go by 4:55am. Mike and I met everyone in the lobby of the hotel and my parents came with us in our car and Mike's parents and Rob went in another car. 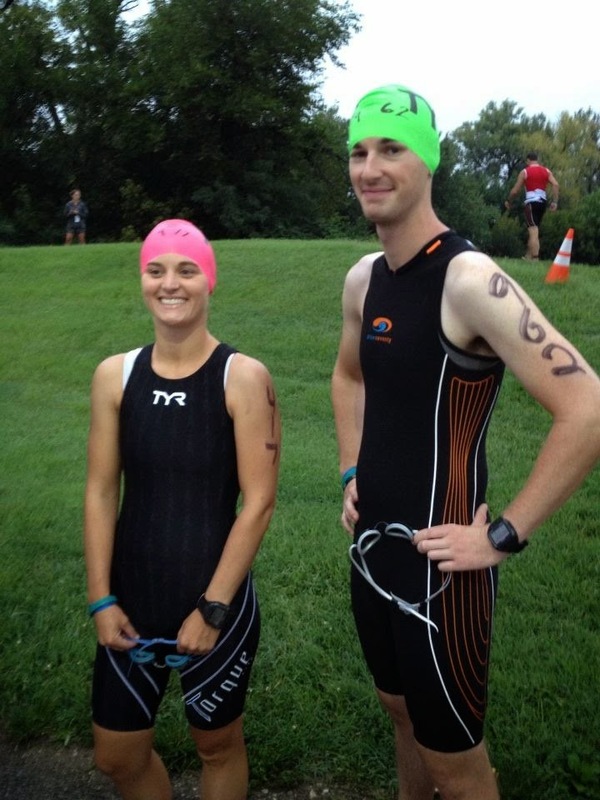 My brother and his girlfriend were going to get to the race after we had started our swim. Our hotel was 15 minutes away from the transition area and we pulled into a parking garage and got out of the car. My mom and dad parked our car for us and we walked to the transition area with our special needs bags, breakfast, morning clothes bags (that we would give to our families), bike pump, nutrition and water. Transition was bustling and we put air in our tires (I also let two people use our pump), filled our water bottles (after I dumped water out of my bento box on my bike, since it had rained over night), put our nutrition in our bento boxes and dropped off our bike and run special needs bags. We met back up with our families and Rob outside of transition and made the slow walk to the swim start about a mile away at Tumbleweed Restaurant. As we walked, I continued to drink water and eat my bagel. I knew it was going to be a hot day so I had been hydrating all week leading up to the race. Body marking was at the swim start, which went quickly, and then Mike and I started walking to the back of the swim line. 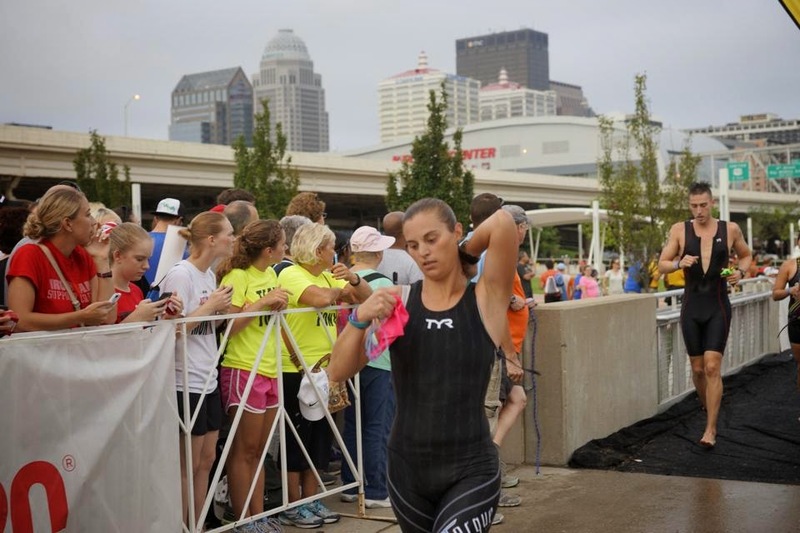 Ironman Louisville is unique in that it has a first come, first served time trial start. The people in the front of the line got there right at 5am! Mike and I kept walking and walking and walking and walking and walking, and then we FINALLY made it to the back of the line. I'll admit that it made me nervous since we would not have the full 17 hours to finish the race (you only have until midnight, no matter when you jump in the water). We did see our table friend from the banquet walk by us, he had to get in line even further back! I had to go to the bathroom while waiting in line, and of course there were no port-a-potties near where we had lined up. So I walked all the way back to the last port-a-potties, while stopping to say hi to Gabi and Pablo who were ahead of us in line. Right when I got in line, a woman said, "the line is going to start moving up!" I panicked and got out of line, without going to the bathroom, and walked back to my spot in line (I probably could have gone to the bathroom, but I worried that Mike wouldn't be in line either and then our spots would be skipped over by other people). We chatted with our families while we waited and slowly moved up, and Mike and I got our speed suits halfway on and our watches ready. At 6:50 we heard the start of the pro men's race and then a few minutes later the start of the pro women's race. 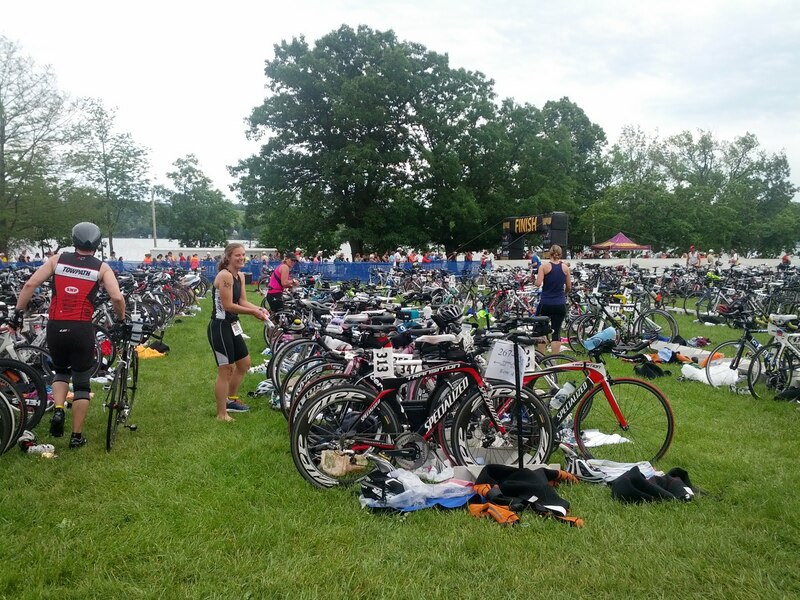 We could even see a few of the pro men swimming by while we waited in line. Ready for our 140.6 mile victory lap! 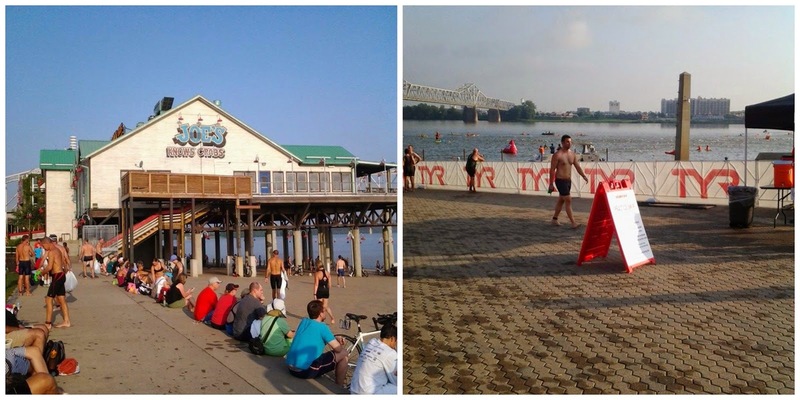 Then at 7am, the cannon for the age group start went off and we knew it wouldn't be too long before we jumped into the Ohio River. We kept walking, while getting our caps on and our speed suits fully on, and I was ready to get the race started! As we got closer we could see the line going down the hill toward the docks. Mike and I gave each other a kiss, wished each other luck, and then made our way down the ramp toward the docks. We saw our families one last time and made the final turn. Athletes could either go left or right, Mike told me to go right and he went left (which meant we jumped off of different docks at almost the exact same time). At 7:24am as I walked on to the dock, I started my watch, and jumped. 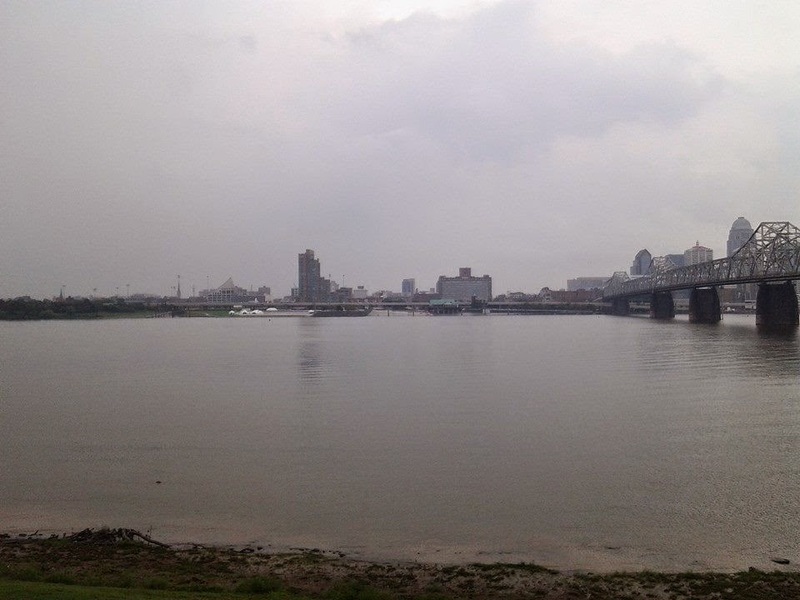 I couldn't see anything (the river is really dirty) and then popped up and started swimming. The beginning of the swim is a little bit congested because you swim in between the shore and an island. I tried to start out at an easy pace, but swimming strong against the current, and tried not to weave around other people too much. I moved all the way over to the left and just tried to pass as many people as I could. And remember that I didn't go to the bathroom right before the start? Yea, I took care of that, twice, in the water. I never said triathlon was glamorous! At one point, I touched someone's feet and the guy turned around and it was Mike! (I asked later if he realized it was me, and he said he thought so). After that I could see him for a little bit, but then I lost him in the masses. I kept swimming, I kicked some people who were getting really close to trying to pull on me/swim over me, and made it past buoy 1, buoy 2, buoy 3, buoy 4. After buoy 4, the water opened up because we were making our way past the island (I touched bottom at one point since I was so close to the island). We had to keep swimming against the current for awhile, and then finally I saw the red "turn" buoy. I had looked at my watch and I was averaging 1:45/100 yards. I didn't let that bother me because I knew that I was going to start swimming with the current as soon as I rounded the red buoy. I really liked this part of the swim because I had a lot more room to breathe and I got in a groove. I checked my watch at one point and I was down to 1:34/100 yards. I was moving! The water got a little chilly in some spots, because we were in open water, but nothing I couldn't handle. Eventually, I passed the final yellow buoy and moved on to the orange buoys. This meant that the first half of the swim was behind me! I could see the three bridges in the distance and pushed to get to them. As we got closer to the first bridge, I could smell some gasoline but that didn't last very long luckily. I looked at my watch one more time and I was down into the 1:2x/100 yards. I got by the second bridge and I knew that I had only a few more minutes of the swim left. I was shocked at my swim time! As I got closer to the exit, I swam as fast as I could, and got to the stairs. A volunteer helped me out and I ran up the stairs and took my cap and goggles off. I ran through the swim exit and struggled to get my speed suit unzipped, but finally got it. I kind of heard my family yelling for me, and I heard Rob yell my name as I made it in to transition. A volunteer yelled my number and as I ran down the row where my bike gear bag was, a volunteer was ready and handed it to me. 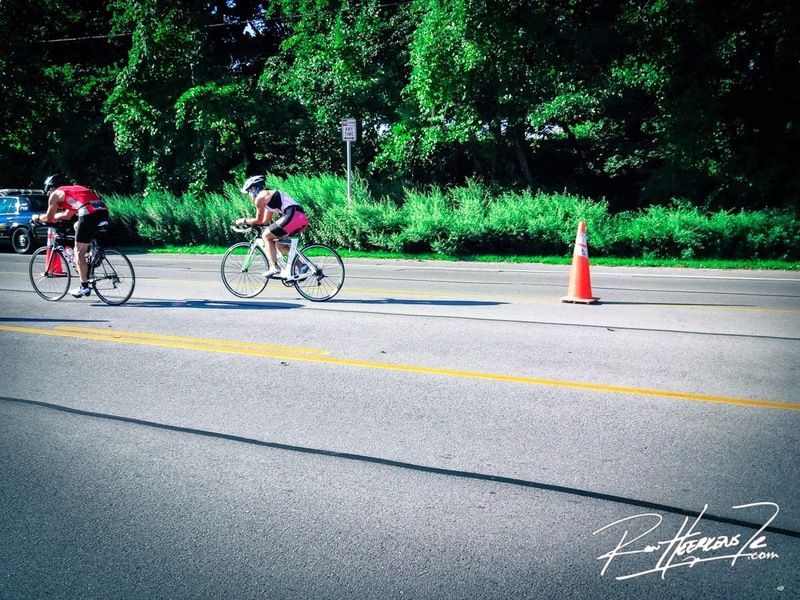 I ran into the women's changing tent and got my speed suit off, put on my helmet, bike shoes, sunglasses and shoved my two clif bars into my jersey pockets. I grabbed some water on my way out and got sunscreened up by a volunteer and ran to my bike. I noticed Mike's bike was still racked as I ran to get my bike (I had no idea if that meant I had a faster swim time than him or what). I got my bike down and ran toward the bike out. I was ready for a 112 mile ride! 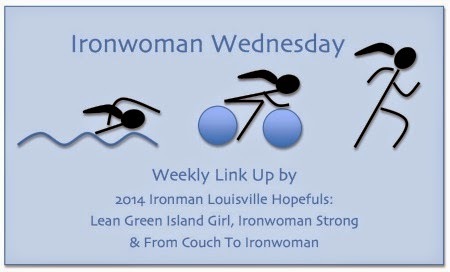 Gabi at Lean Green Island Girl, Michelle at Ironwoman Strong and I are all officially Ironwomen! (And Mike is an Ironman!) I am so proud of the two of them, I was able to meet and see Gabi out on the course multiple times and knowing we were all out there working toward the same goal was so helpful. Unfortunately, we never got to meet Michelle (but I was looking for her) but I'm sure that will change in the future! At the banquet they announced that women were 24% of the field, the rest were men. 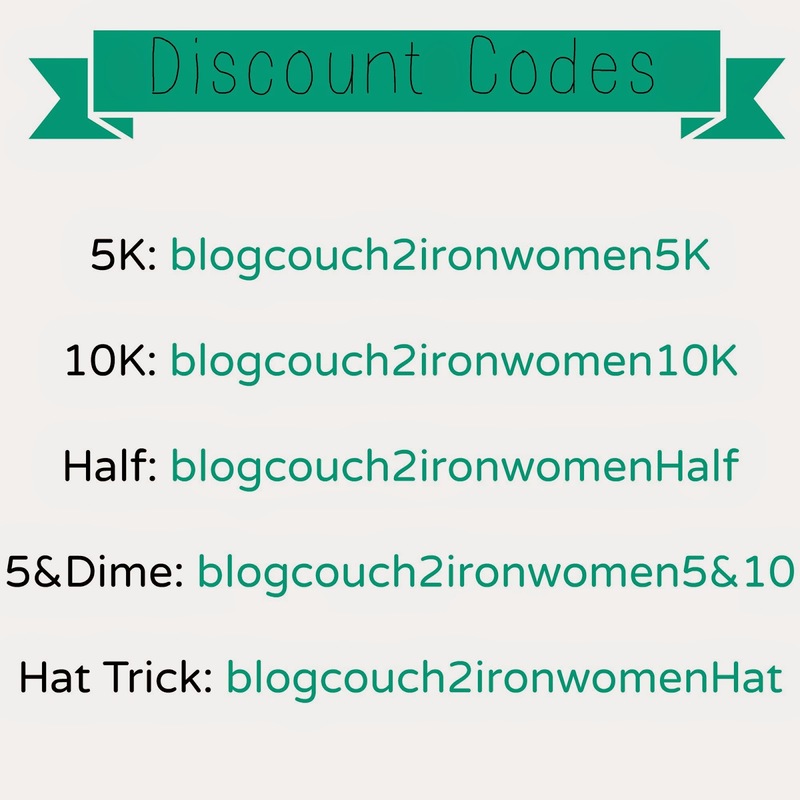 Knowing that three of us did in fact become "Ironwomen" makes me even more proud of what I accomplished. Anything is truly possible if you put your mind to it, and don't mind some hard work and dedication. 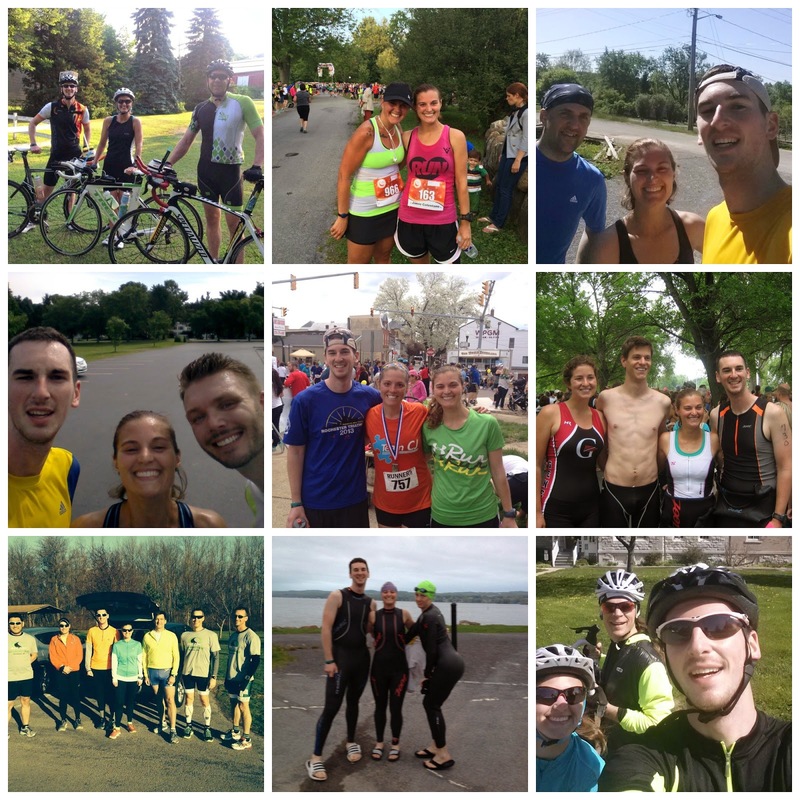 If you know me and my long-distance tri recaps, this is going to be broken up into multiple parts, the swim, the bike and the run. Sorry, but it was a long day and I have a lot to say about it! 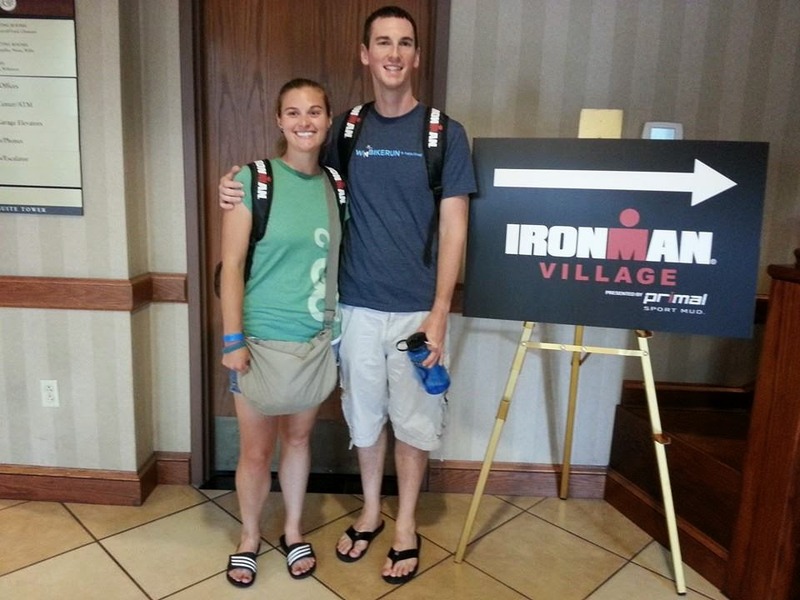 That should now say, Ironman Finishers! 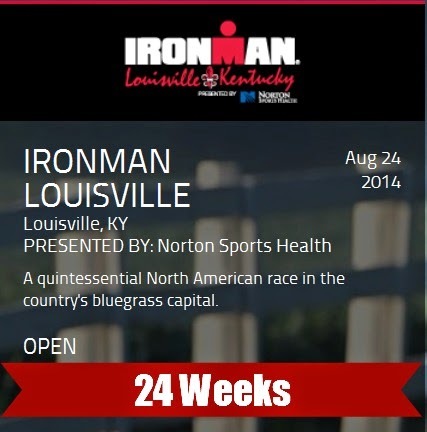 Really, I am going to start this one off before the start of the swim leg of Ironman Louisville. Mike and I left Rochester on Thursday in the afternoon and drove to Columbus, Ohio to break up our trip. It is about a 10 hour drive to Louisville from our house. We had done a 15 mile ride at our house before leaving and when we got to our hotel we got ready for a short 2-mile shakeout run. 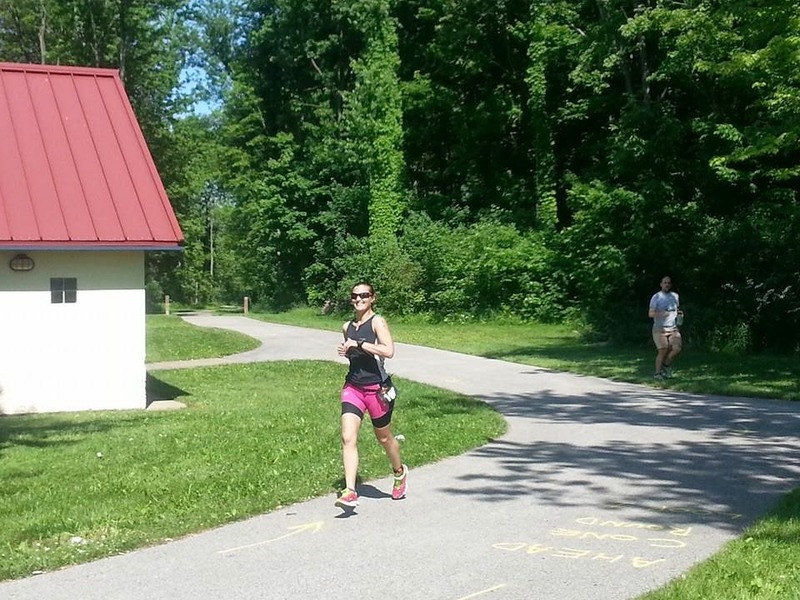 I'm pretty proud of the place that I picked for us to run at, the Olentangy Trail starting at Antrim Park. We ran around Antrim Lake and it was really pretty! 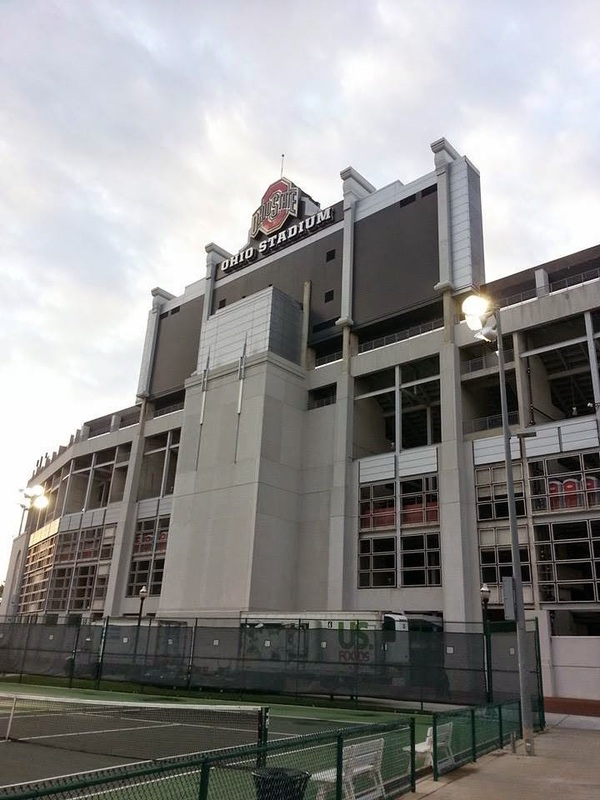 We also hit up THE Ohio State University and ate at an amazing Mexican Restaurant. The next morning we finished our drive to Louisville and went to our hotel that we were all staying at, where Mike's parents already were. We got there before we could check-in, so we went to take care of all of the race stuff that we had to do. The Athlete Village was at the Galt House in downtown Louisville. Mike's parents drove us there and we got checked in relatively quickly. It was pretty amazing to see all the volunteers and athletes! We decided that day that we were going to go to the Athlete Banquet later in the evening with Mike's parents and our friend, Rob, who came to support us all weekend as well. After going to the mandatory athlete briefing and buying a few things at the expo, we went to drive the bike course. I think doing so helped ease our minds a bit, yes there were some hills but nothing we couldn't handle! At the athlete banquet, the food was not what was important, the stories that we heard almost made me cry and I was getting even more excited for the race on Sunday! I met Gabi and her husband, Pablo, at the banquet too. Our table friend (as I called him) was funny and told us that we could get through the race. The rest of the night was spent packing up our bike gear, run gear, bike special needs and run special needs bags. It looked like triathlon threw up all over our room! 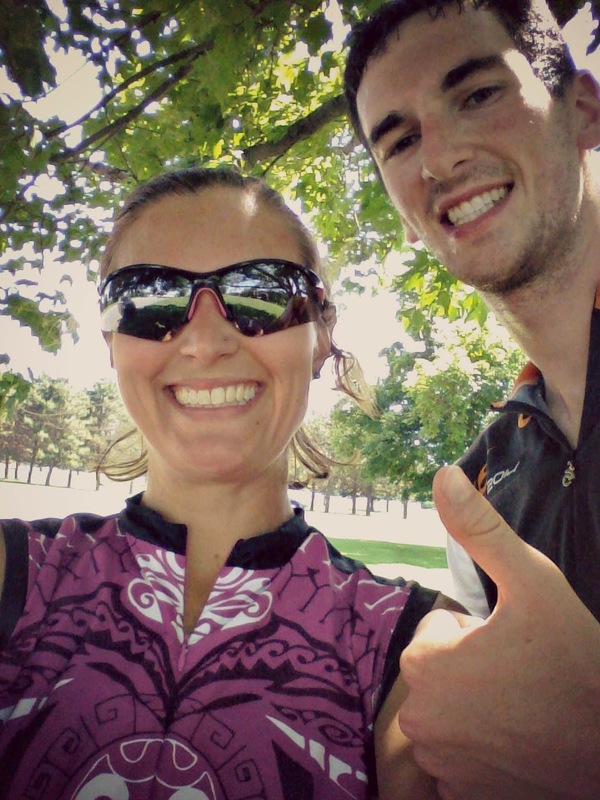 Saturday morning, Mike and I went to go get our final Ironman training workouts in! 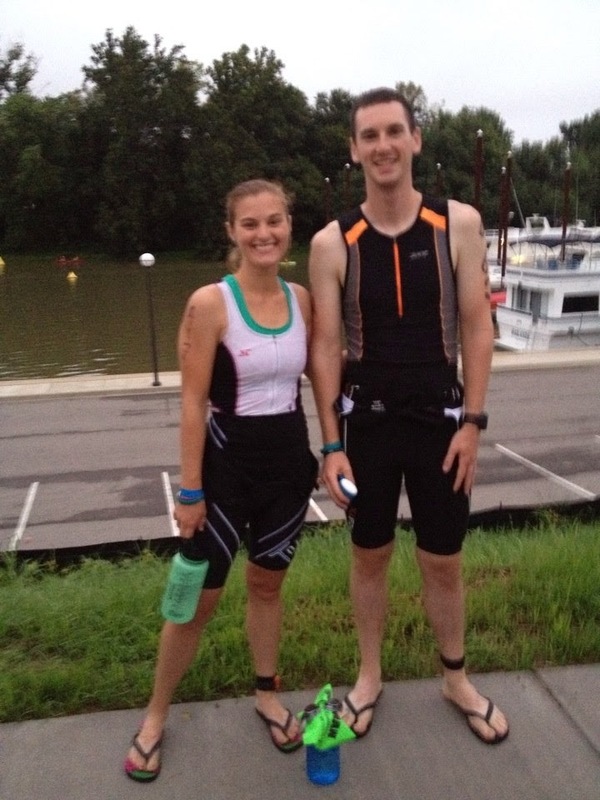 We just had a short swim, bike and run planned and we went to the practice swim in the morning. 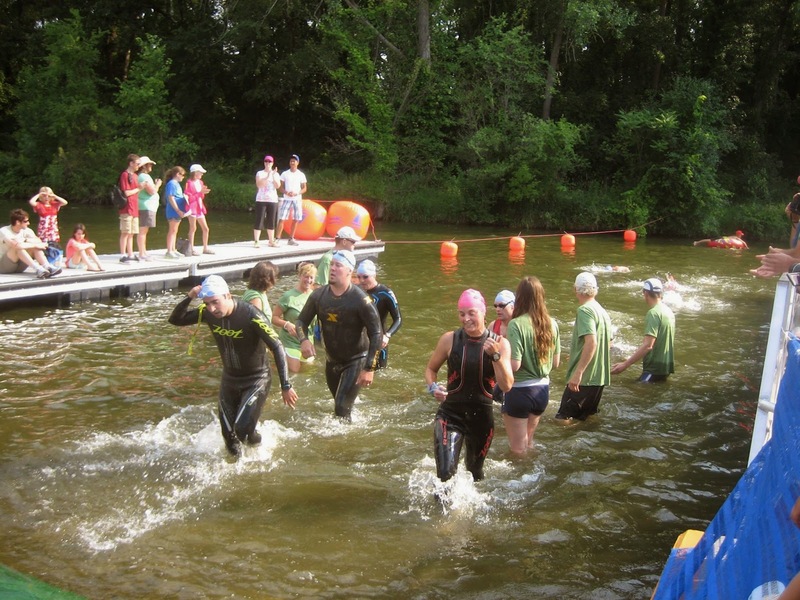 The practice swim took place at the swim exit and they had a 600 meter (or so) course set up in between two bridges. 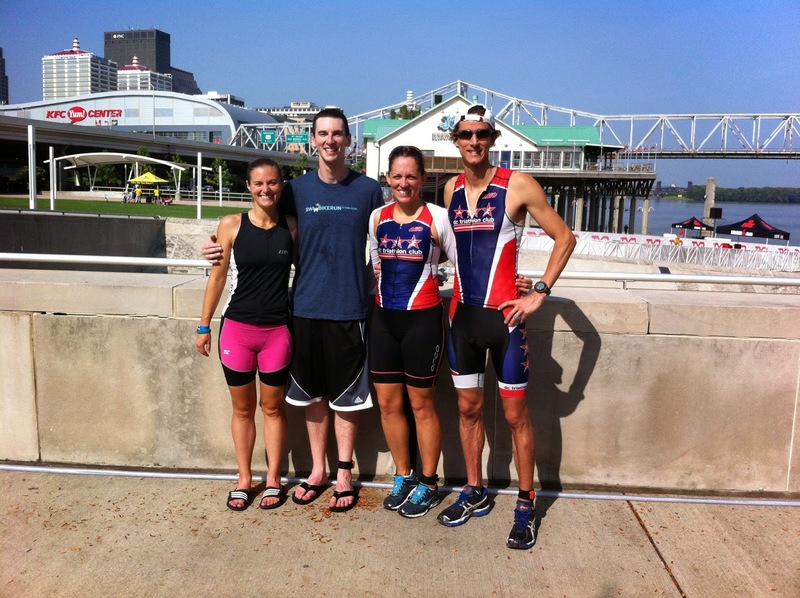 The Ohio River has a strong current and this swim made me a bit concerned for the race! The current on the way out (the same direction we would be starting our swim the next morning) was RIDICULOUS! It took me 20 something minutes to not even get all the way to the bridge. As soon as I turned around, I was immediately back at the other bridge and the swim exit. The current was really, really strong. Mike and I tried not to worry about it, but we did feel like it was a bit of wasted effort. Regardless, we went on to bike about 5-6 miles of the beginning/end of the bike course and ran a little less than 2 miles near the Great Lawn (transition). While we were biking I saw our table friend from the banquet and we saw Gabi and Pablo! After we were done we went over to take a photo with both of them and chat some more. Mike got our bikes ready for race day! 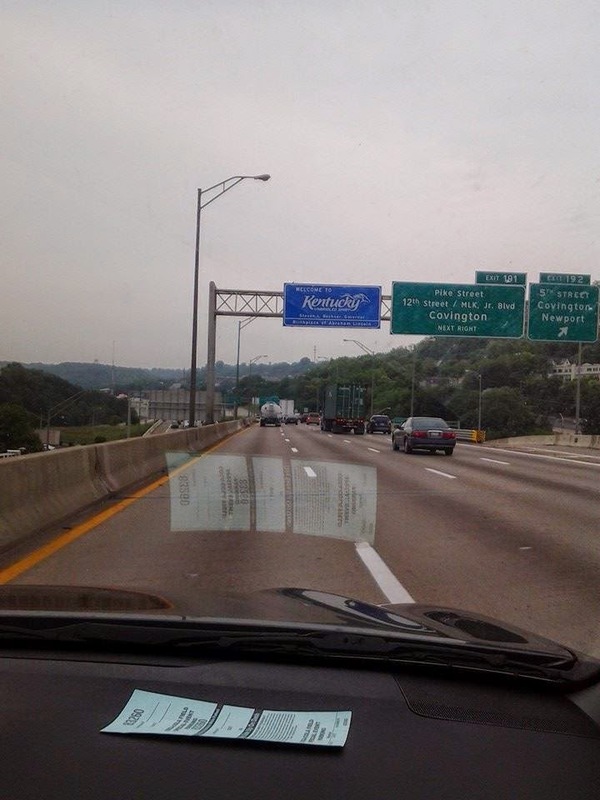 My parents had arrived in Louisville while we were doing our final practice workouts, so we headed back to the hotel. We had some last minute stuff to do to our bikes and our gear bags before we went to drop them off in transition. 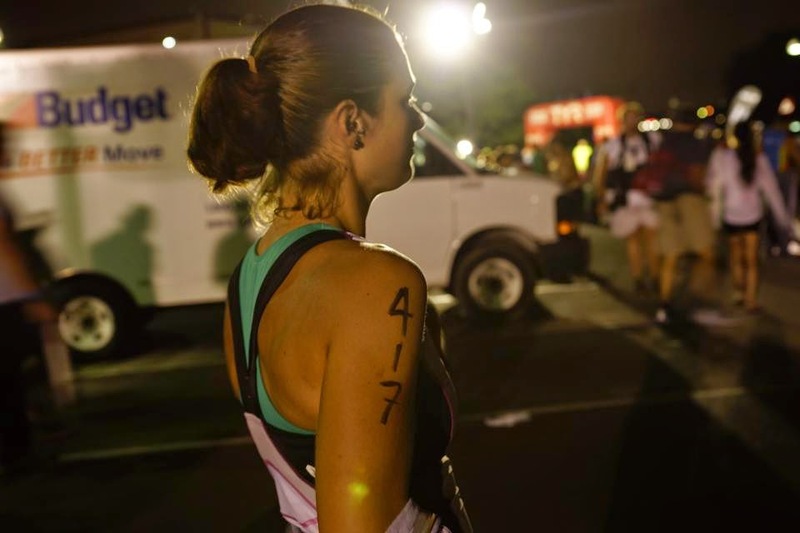 The volunteers at gear check walk you through the transition area and how Sunday will go. My volunteer was really nice and he brought me to my spot on the bike rack and to where my bike gear and run gear bags would be during the race. He also showed me where the women's changing tent and the sunscreen station would be, as well as where to bike out and run out. After that, Mike and I needed to eat something so we all went to Subway for a quick bite to eat since we were planning on eating dinner at 5:30pm. Mike with the Louisville Slugger! We did some sight-seeing. Nothing major since I didn't want to be walking around too much. 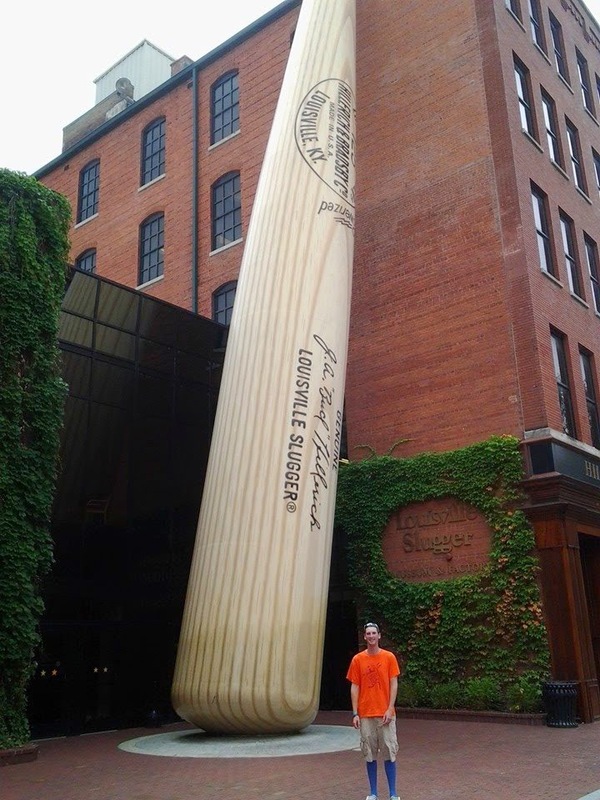 We went to the Louisville Slugger Museum so we could see the giant bat, and while we were taking some photos I saw my brother, Justin, and his girlfriend, Hanna, walk up! It was a complete surprise (which is typical with my family) and I was really happy that they came to support us during our Ironman. 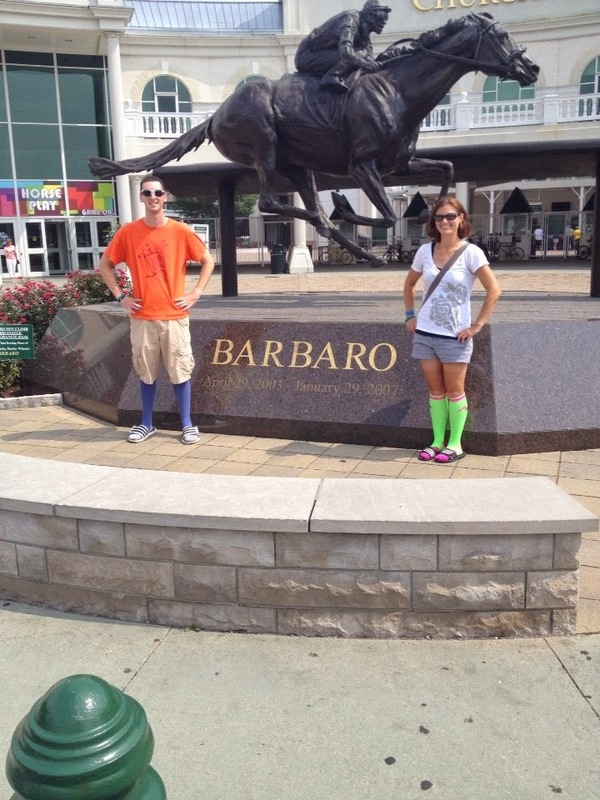 We ended the sight-seeing at Churchill Downs before going back to the hotel to relax for a little while. A few weeks before the race Rob had given me a list of restaurants that someone he knows from Louisville had given to him. I decided that going across the bridge into Indiana would be a good choice since I figured that downtown would be a little bit crazy! We had dinner at Rocky's and it was really good! We all just took the time to talk some more and get ready for the big day ahead. Mike and I finished out the night with epsom salt baths and making sure that we had all of our swim gear that we needed for the morning ready. After watching some tv, we went to bed around 9:30pm. And just like that, it was one more sleep until Ironman Louisville! Thirteen days. 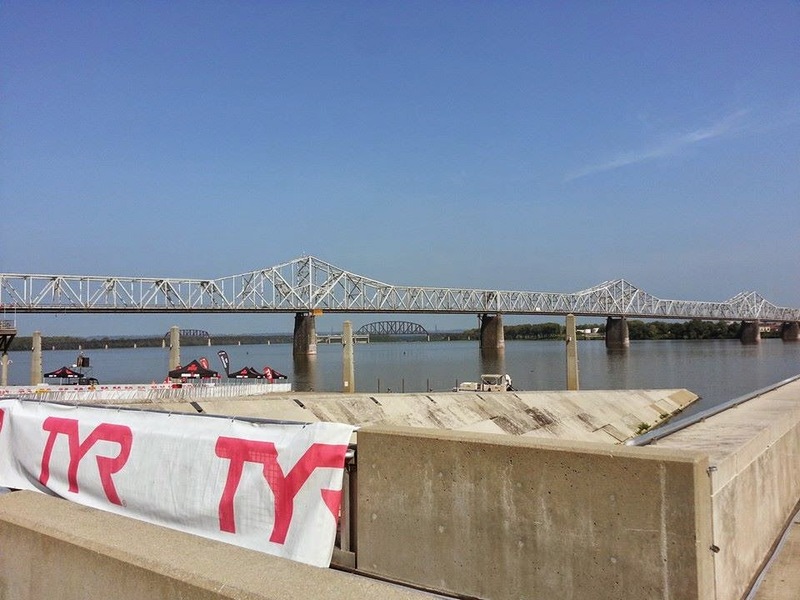 In thirteen days, we'll be jumping into the Ohio River to start our 140.6 mile victory lap and I can't wait! This may even be the last training update until after the race since I probably won't have time to recap the next two weeks before August 24th. Oh boy, this week. For the most part it was good, even though Mike was coming off a cold that he got over the previous weekend and I was going through the full-blown thing. Nothing worse than a summer cold. It really didn't hit me until the run over the weekend, but more on that soon. Even though I was sick, I didn't want to miss many or any workouts (we have only been swimming once a week instead of two to three times, but for us that's not detrimental to our training). We switched to just swimming on Tuesday to give us both some time to recover. I still felt pretty lousy on Wednesday when we did our brick, but I sweat through it. 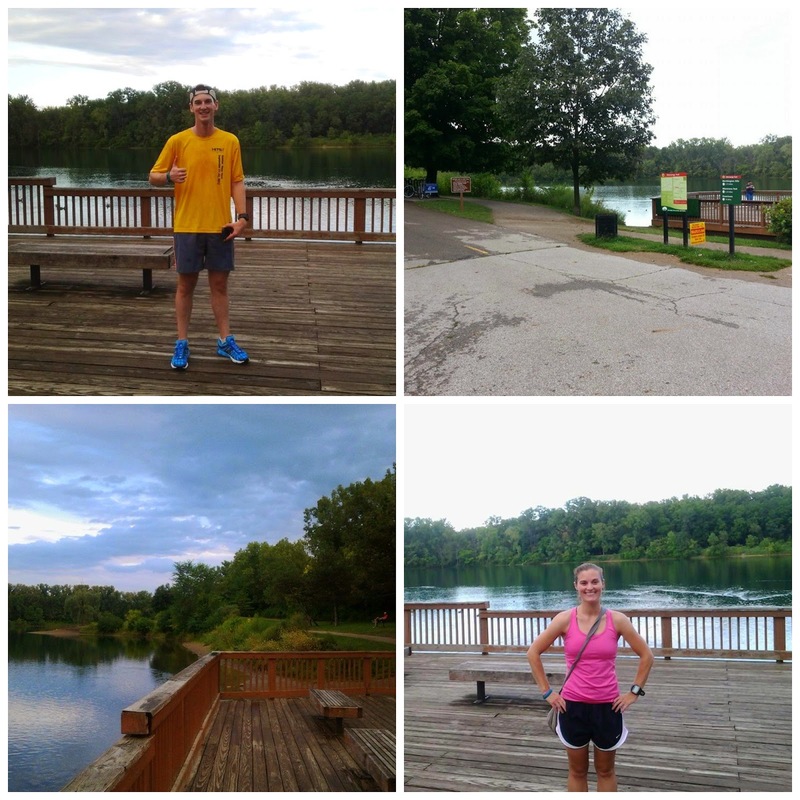 We biked 25 miles and then our friend, Rob, met up with us for a 5 mile run on trails through Whiting Road Park. We hadn't run trails in awhile and it was a nice change of pace. I did ask the guys if it was humid out or if I was just sweating like crazy because I was sick, though! 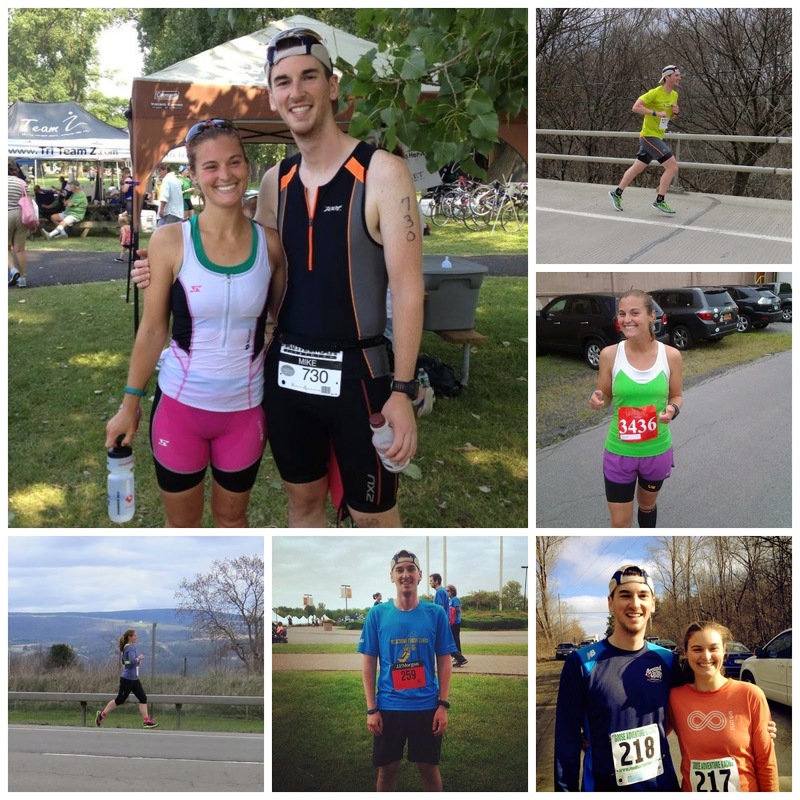 Thursday we celebrated our four year wedding anniversary with a 10K race where we got married. 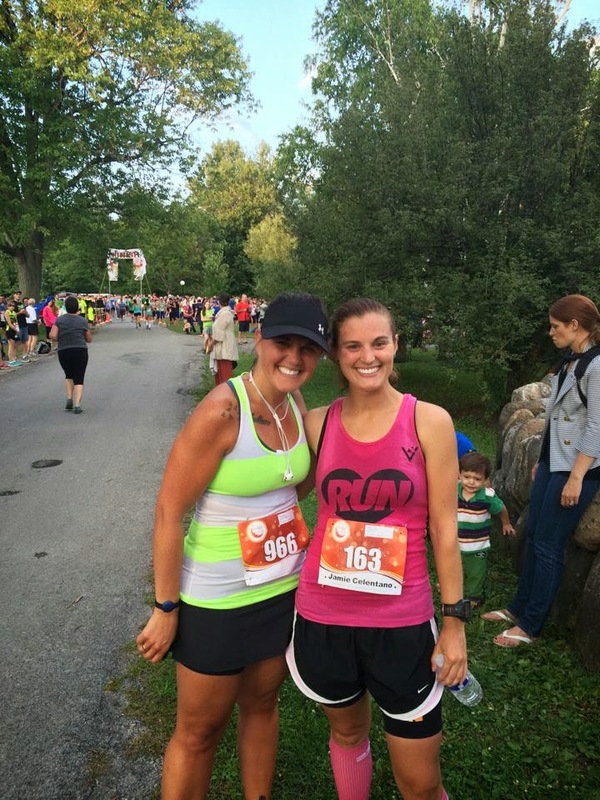 I decided to not race it and instead paced our friend, Sarah, to a HUGE 10K PR! It was the right decision since I didn't tax myself too much and I felt, a bit, better on Friday. Mike got a new PR, even if it was only by a few seconds! Friday we rode with our friend Greg and I felt pretty good. I could tell I still wasn't 100% though. 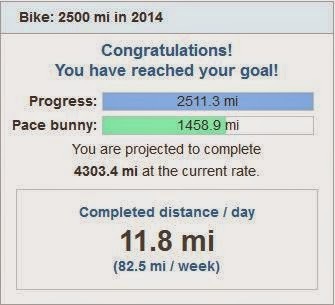 I did hit my yearly biking mileage goal during this ride (2,500 miles) so that was pretty cool! The weekend, at least Saturday, is when things went a little bit wrong. I was not feeling making any routes over the weekend (luckily, our friend Greg made our bike route for Sunday) but we decided we were going to run near our bike shop so Mike could drop his bike off after (he needed a new chain). Mike made a route that started on the canal path and then ran along another gravel trail to some roads and then back to the canal path to the car. I wrote down the route in the morning and we started out really well, if a bit too fast. Our first 7 miles went like this: 9:22, 9:12, 9:20, 9:23, 9:23, 9:20, 9:22. Not too shabby, right? Well, then I started to feel the impact of my cold and the heat was starting to get to me. After we got off the canal path, I had to walk a little bit and our next two miles were like this: 10:06, 10:21. Not bad and the run would have been respectable if I could have kept it like that, but unfortunately, I mentally (and physically) let the negative thoughts and how I was feeling win. The end of the run turned out like this: 12:14, 11:16, 12:35, 11:05, 11:43. Considering I had been sick an average pace of 10:21 isn't terrible and if we had ended the run like that I would have been alright with it. Unfortunately, I screwed up BIG TIME. When I wrote down the route in the morning, I wrote a left instead of a right at one of the turns. Since we aren't as familiar with the area and that road still hit the next road we were looking for from that direction, we didn't think anything of it (I had kind of thought that when the road changed names that something wasn't right, but I wasn't feeling well so we kept going). 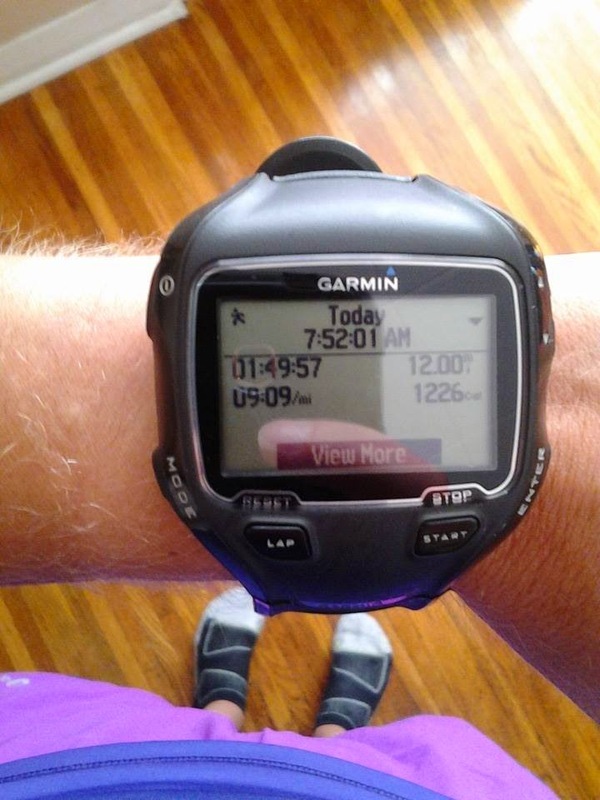 Mike said to me, about 13.1 miles into the run, "I don't see how this mapped out to 13.8 miles". Well that's because I messed up! We ended up having to walk 5.23 miles back to the car. We didn't have a cell phone with us and neither of us was thinking right and didn't flag anyone down to drive us back to our car. That was the WORST mistake ever. 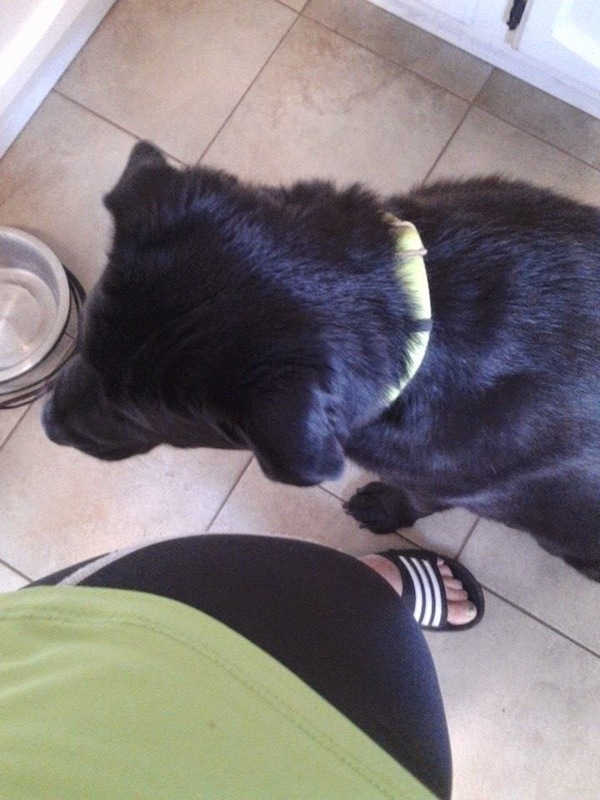 We both ran out of water and by the time we got back I was feeling even worse. Luckily, after re-hydrating and relaxing I don't think that this negatively impacted us too much. Our ride on Sunday went well and we rode with Greg again. Even though it was raining, we had a fun time getting almost 80 miles in with him. So, this week was mostly good, some bad and some really, really, really bad! This week went well! We had to rearrange our schedule a lot this week because I brought my bike in for a new chain, new tires, a behind the seat bottle cage install and a race day check (Mike's is currently back at the shop for a new tire and a race day check, we need to buy stock in Towpath Bike). 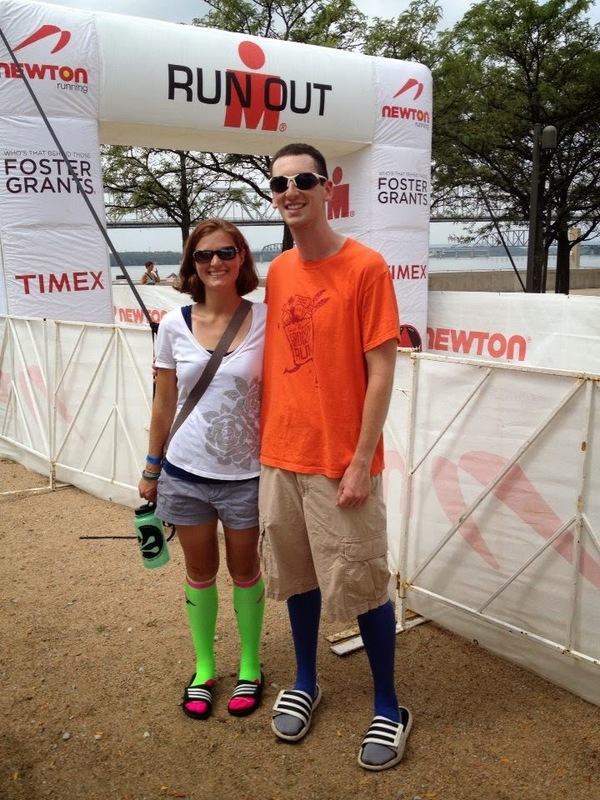 We did an OWS on Tuesday to test out possible race day outfits for the swim. 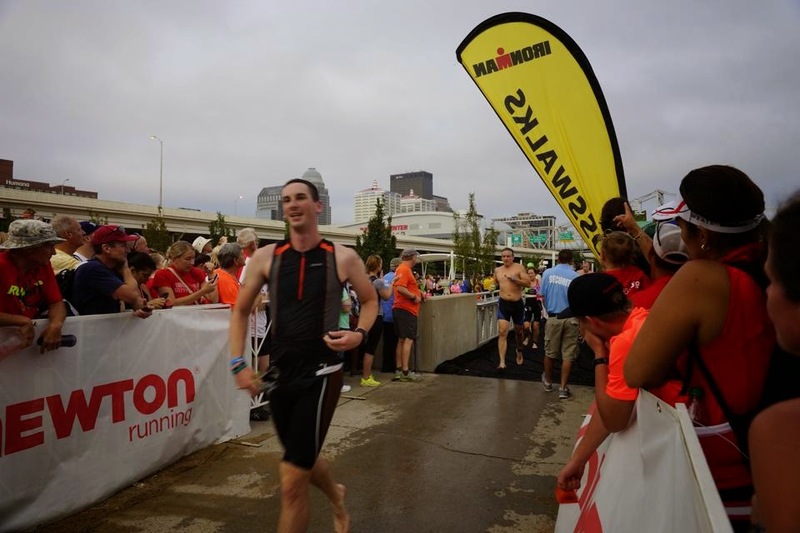 Ironman Louisville will not be wetsuit legal and while you CAN wear wetsuits if the water temperature is between 78 degrees and 84 degrees you can't be eligible for awards (and they usually make you go last). Since we are good swimmers we don't need wetsuits. I tested out swimming in tri shorts and a sports bra and it did not go well. Too much drag. We both decided to buy speeds suits, Mike's has arrived (and he swam in it this morning) and I am still waiting on mine, hopefully it comes soon! The rest of the week was full of faster than normal runs (a lot of which were progression runs). Our run on Wednesday was FAST! 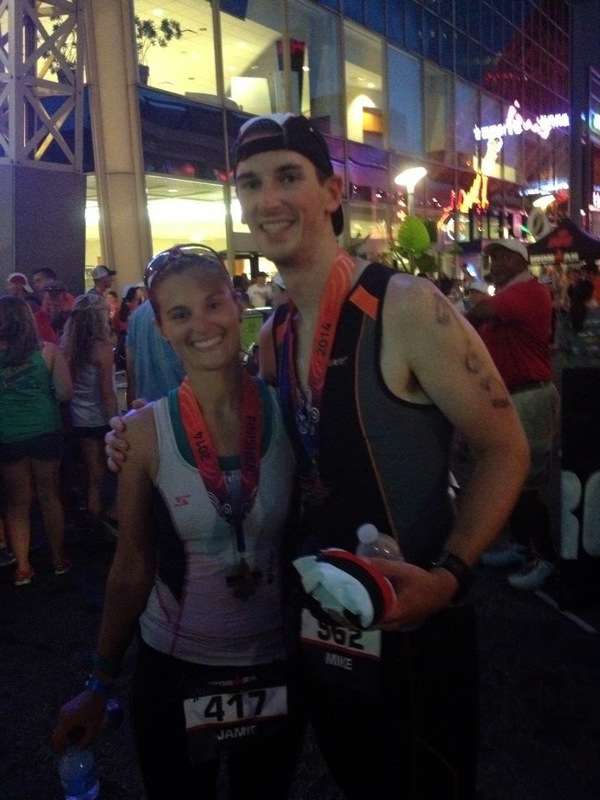 We didn't plan to do a progression run but it ended up being: 8:24, 8:09, 8:05, 7:55, 7:49. Mike's birthday was on Thursday and we were going to do our brick, but because Mike got a flat (that took a bit to fix) and we were meeting people for dinner 15 minutes after we got back to the car, we had to postpone it to Friday. 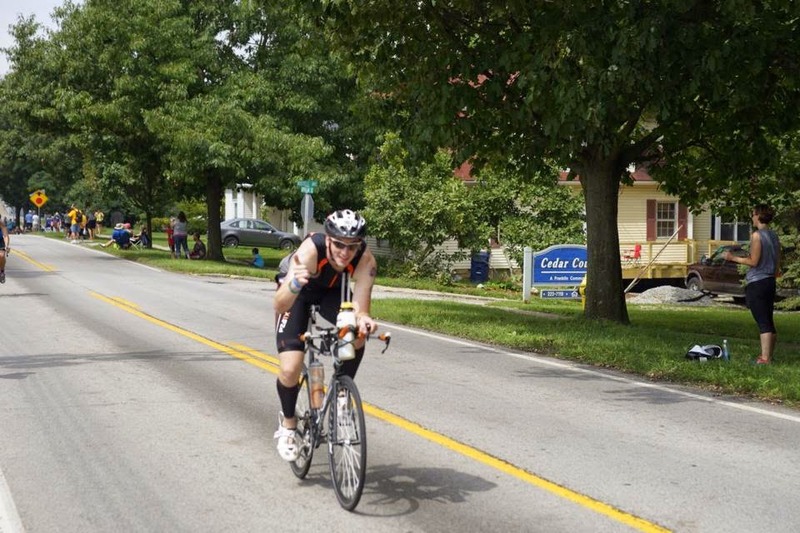 The ride and run for our brick ended up being fast, I averaged 16.9mph for the almost 26 bike miles and then we ran another progression run (8:14, 8:12, 8:05, 7:45). Like I said on my personal Facebook page, this isn't really the time for a running growth spurt, but I'll take it! No more double digit runs left! Saturday went MUCH better than last weekend. Mike and I ran a route out near Braddock Bay, which is pretty flat but since our Ironman has less than 300 feet of elevation gain on the run that's fine. We averaged around 9:09 pace for the 12 miles. 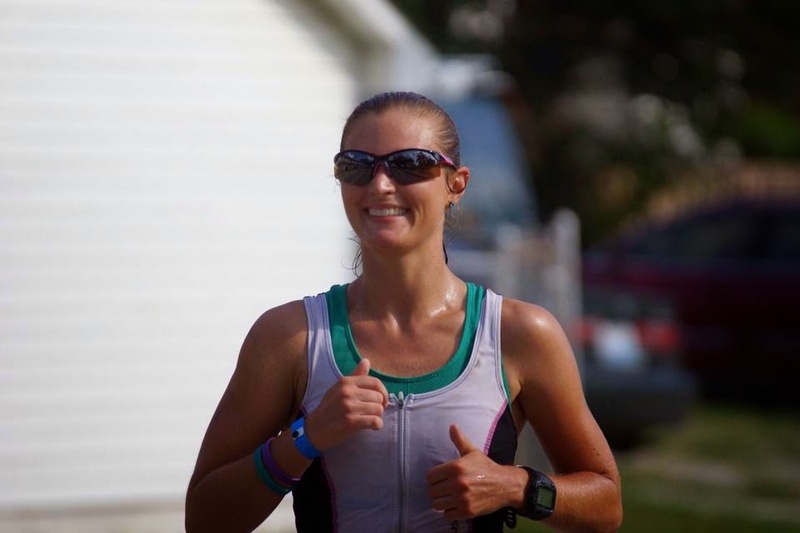 We had planned on swimming after, but since we were volunteering at the Beast of Burden 50 and 100 Mile Ultra race we wanted to give ourselves enough time to get ready. We volunteered with our friend, Rob, and we manned one of the aid stations from 2-6pm. It was a lot of fun! We love to volunteer and volunteering before our goal races always helps us to feel inspired, and ready to race! Sunday we rode a little over 62 miles and ran 2 miles with our friend Greg. The ride was really nice, some rolling hills, a few bigger climbs in the middle and more downhill/rolling hills to finish out the ride. The three of us ran on multi-track at Black Creek Park after the ride. We were going to swim, but when we got to Braddock Bay there were WAY too many boats! Mike did get in to try his speed suit out. 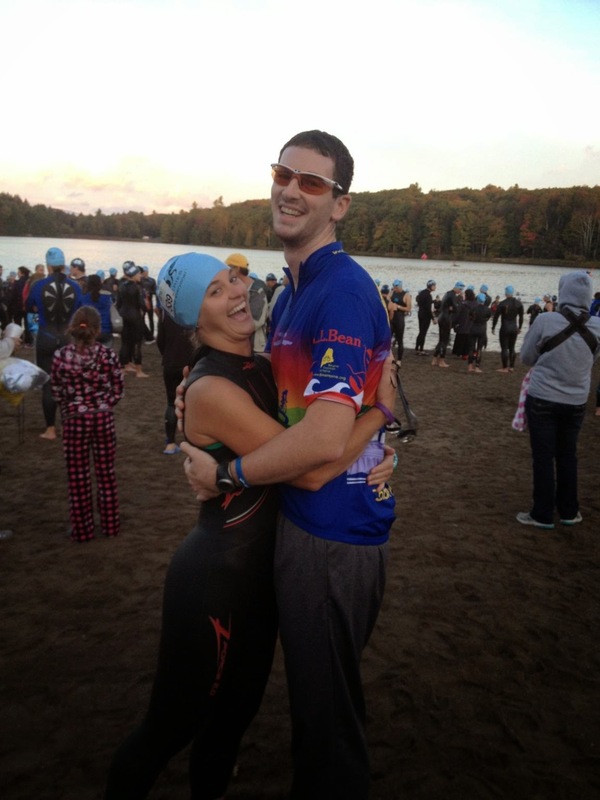 I was disappointed we didn't get to swim a second time this past week, but Mike and I made up for it by getting in an open water swim at 6am today! Not much longer now and we get to put all this training to the test!